Trevor and I got to go to the Rascal Flatts concert on Friday night! Let me tell you.... IT WAS AMAZING!! I saw them about three yers ago, in concert, and about died. So when I found out that they were coming again, I about peed my pants. 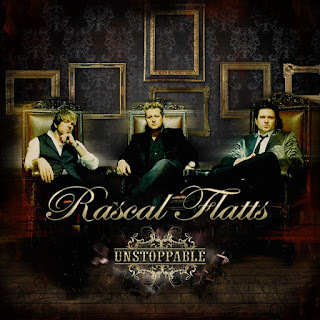 I absolutley LOVE Rascal Flatts. They have been my favorite country band for forever. The thing that I also love about them is that they sound so good live! I hate going to concerts and hearing a band sound completley different from what they sound like on the radio or their CD. That isn't the case with Rascal Flatts. Compare one of their live performances to a song on their album and you will not be able to tell a difference! I was so glad Trevor was able to come with me this time. Last time I went, Trevor had just left on his mission about a month before they came... So he missed out! He loved them too and we both agree that they are the best performers LIVE! I am kind of bummed though because my stupid camera on my phone wouldnt take any good pictures so I don't have any! I forgot to mention.... That night, our night turned from completley awesome to a compltete WRECK! Before the concert we decided to park our car in a parking lot right next to Cricket Pavilion because we didn't want to get stuck in traffic when the concert was over. So we totally thought we scored with an awesome parking spot and no traffic latter on. Little did we know, our plan wasn't a very good plan after all. After the concert was over, we started walking back to our car, before anyone else, to beat the traffic. As we start walking around the corner, my heart started to pound because I did not see our car! We looked around and made sure that was where we parked and it definitley was! I was so scared that someone had stolen it since we were way out in downtown Phoenix... But then we noticed a stupid little sign at the top of a light pole that said "This is a Towing Zone. Do not Park here." Come on.. Seriously?? They had to make that sign so little and stick it so far up on the light pole so we couldn't see it! When we were looking around, we noticed that like EIGHT other people got their cars towed too. It was like the towing truck sat there and watched us all park and then towed our cars right when we left! We were pretty mad, let me tell you... So we call the number on the sign and the lady on the other end tells us that we cannot pick up my car until tomorrow morning at 10 a.m.!!! Seriously I wanted to cry... It was like 11:30 p.m. and we were stuck in downtown Phoenix with a bunch of crazy drunk people and I just wanted to get home. We started calling our family members and no one would answer the stupid phone! Finally, we got a hold of one of a really good friends, Bret, and he came and got us. By the time Bret came and got us and drove us home, it was now 1:30 in the morning and by the time we got to bed it was 2 a.m. Trevor was supposed to work the next day at 5 a.m.! Ha yeah right... I made him call in and tell them he couldn't come in. There was no way he would make it to work that early. Well AWESOME for the concert but sucky for the tow. Dang!